New Society Publishers, 9780865716216, 257pp. Easy-to-understand, accurate, and comprehensive, this is the guide for anyone interested in installing a solar electric system. Power from the Sun provides a basic understanding of electricity, solar energy and the sun, and solar site assessment. It discusses the types of photovoltaics (PVs) and PV systems, advances in PVs, charge controllers, inverters, batteries, and generators, as well as the installation and maintenance of a PV system. This book is written for the layperson and is designed to raise the solar electricity literacy of readers. It provides a great overview of the many options available and is designed to help homeowners make wise decisions during the design, purchase, and installation of solar electric systems--and save a lot of money. 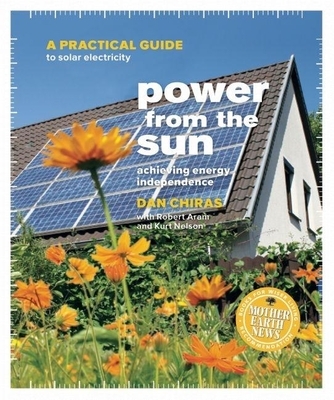 Providing readers with the knowledge necessary to communicate effectively with PV installers, Power From the Sun is a great guide for homeowners, business owners, installers, architects, building department officials, utility company employees, and just about anyone else who wants to lower their energy bills or achieve greater energy independence. Dan Chiras is president of Sustainable Systems Design, Inc., a residential renewable energy and green building consulting firm, and is director of The Evergreen Institute's Center for Renewable Energy and Green Building, which offers workshops on residential renewable energy and green building. He is an internationally acclaimed speaker and author and has published twenty-five books, including The Homeowner's Guide to Renewable Energy and Power from the Wind. Dan Chiras is an internationally acclaimed author who has published over 24 books, including The Homeowner's Guide to Renewable Energy. He is a certified wind site assessor and has installed several residential wind systems. Dan lives in a passive solar home in Evergreen, Colorado.